The idea of cloud computing is not new. Viewing computing as a utility dates back to at least the invention of timesharing. One can argue that it is not a matter of whether cloud computing will become ubiquitous, because the economic forces are inescapable, but rather what we can do to improve our ability to provide users and providers of cloud computing with trust in the software services and infrastructure that make up the cloud. In this presentation we address the trustworthiness of cloud computing in terms of transparency, expectations, architecture, and vulnerabilities. 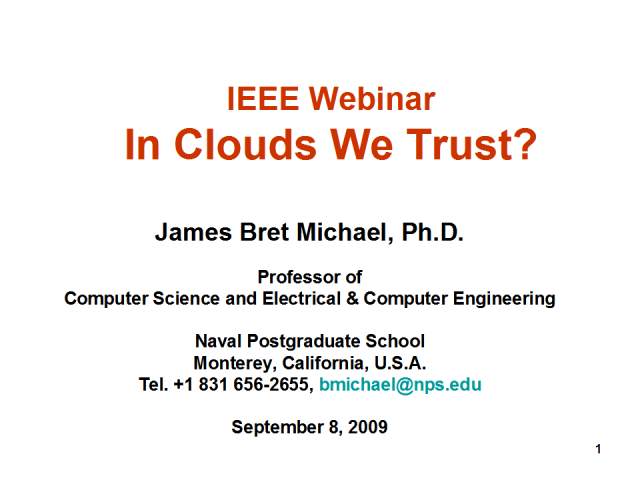 Bret Michael is a Professor of Computer Science and Electrical & Computer Engineering at the Naval Postgraduate School. His research addresses the reliability, safety, and security of distributed systems. Bret serves on the government steering committee of the Information Assurance Technology Analysis Center, is Associated Editor-in-Chief of IEEE Security & Privacy magazine, is an associate editor for the IEEE Systems Journal, chairs the IEEE Technical Committee on Safety of Systems, and serves on the IEEE Computer Society’s Professional Practices Committee and the Reliability Society’s Administrative Committee. He has a PhD in Information Technology from George Mason University in 1993. Contact him at bmichael@nps.edu. Title: In Clouds we Trust?